Vasco & Piero's Pavilion Restaurant. Just change the name to "Incredible Italian" already! It's not often you get to eat somewhere so good you wonder if you can get back for another meal before leaving the country. This is just one of those places. Vasco & Piero's is a completely unassuming Italian eatery (specifically Umbrian, from central Italy) on Poland Street, just a few blocks from the shopping mayhem of Regent and Oxford Streets. We had a group dinner there, table for 10, and the menu is prix fix. Two or three courses, choose from a relatively small selection, and off you go. 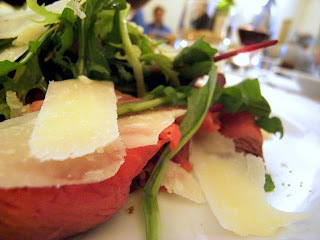 My first course was a Beef Carpaccio, which is one of those dishes I truly adore and tend to judge Italian restaurants by. I believe I missed on the menu the detail that it was a roast beef carpaccio, which someone pointed out afterwards, so it was actually a bit thicker cut and basically rare beef, not raw beef, on the plate. But it was very tasty, served with fresh arugula and generous portion of parmigiano reggiano. When I joined the table, I was told immediately that "pasta was a must-have" at this restaurant. It's all homemade, fresh and apparently quite good. 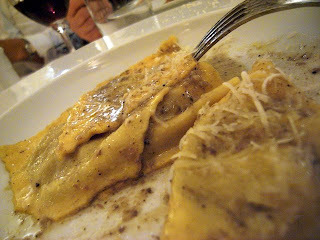 A quick scan of the menu revealed a few choice dishes, but one stood above the rest -- the Hand Made Wild Mushroom Tortelloni -- so I ordered that. Ohhh, what a good choice. This may well have been some of the best I've ever had. The pasta was so delicate that it nearly melted in your mouth. It was firm under the fork but like warm butter on the tongue. The wild mushrooms inside were apparently very finely chopped, and once cooked was nearly a paste in the pasta that just contributed to the melted butter experience. I savored every last bite, and my only regret was that there wasn't more on the plate. I could have continued to eat until they rolled me out of there. It was truly that good. Clearly you can't enjoy a dinner this good and not partake in desert. 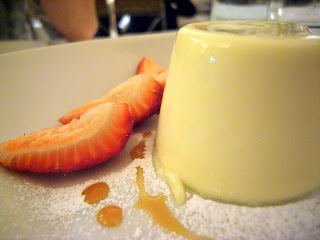 Pana Cotta with Strawberries jumped off the list, and I'm sure my friends who left the table early will see this and be kicking themselves for leaving. It was superb, and even the strawberries which were a bit on the pale side of red, were delicious. verdict: A superb meal, with some of the best pasta I've ever had. Definitely worth a reservation your next trip to London. And yes I upgraded this to 5 feet… after some pondering, everyone there enjoyed their meal as much as I did, and I think it's worth the rating.